Canine Companions for Independence and Chipotle Mexican Grill are teaming up in Southern California to Cause an Effect. On Saturday, September 15, in any Chipotle restaurant from Fresno down to San Diego, people can show a flier or mention Canine Companions to the cashier before they pay, and 50% of fundraiser sales will go towards helping us provide more expertly-trained assistance dogs to people with disabilities. 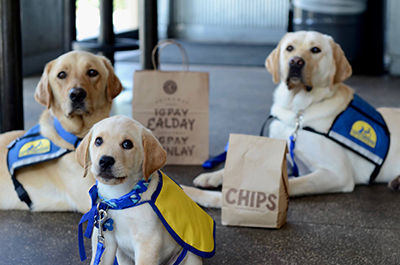 Chipotle often supports meaningful community organizations, like Canine Companions for Independence. Canine Companions for Independence is a nonprofit organization that enhances the lives of people with disabilities by providing assistance dogs and ongoing support to ensure quality partnerships. Established in 1975, Canine Companions has six training centers across the country, including two in California, one in Florida, Ohio, New York and Texas. Canine Companions is recognized worldwide for the excellence of its dogs, and the quality and longevity of the matches it makes between dogs and people. Although the price to raise, train and provide ongoing support for our dogs is estimated at $50,000, we provide our assistance dogs completely free of charge to recipients. To download the flier to show at the register, go to cci.org/ChipotleDay. To find the Chipotle nearest you, visit chipotle.com. You can learn more about Canine Companions for Independence by calling 1-800-572-BARK or visiting cci.org.